Kitchen Ventilation Equipment - Please contact us directly on 0161 336 5065 for bespoke products not listed as we specialise in made-to-measure vents and custom designs. 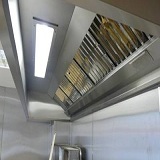 Kitchen ventilation is an important factor when planning your commercial kitchen design. 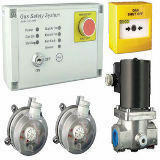 Good ventilation is not simply a way to improve your working environment, it is a necessity. New kitchens that don't have provisions for adequate ventilation in their design are likely to be rejected by the local authority. Combi-Vent offer a range of Primus kitchen ventilation systems that encompass all aspects of energy efficient air movement within the modern commercial kitchen. The canopy construction has been revised to improve product quality, efficiency and aesthetics. The gas ventilation and interlock panels we supply for commercial kitchen applications will allow you to fully meet the requirements of BS6173:2009. Combi-Vent can also design, supply and install solutions to eradicate excessive system noise and odour using reliable and proven attenuation and odour control products. Contact us now to discuss your commercial kitchen requirements.